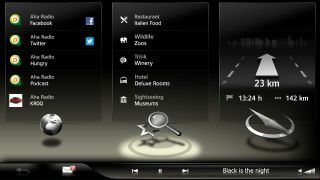 Harman, one of the largest suppliers of in-car tech, is wowing the CES 2013 crowds with what it claims is the most advanced in-car infotainment system in the world. And you can buy it today from BMW. Harman, the company behind brands like Harman Kardon, JBL and Mark Levinson, is also showing off its next-gen in-car platforms, due to be rolled out in cars from several manufacturers later in 2013 and beyond. But what's causing Harman and BMW to tout the ConnectedDrive platform as the "world's most advanced infotainment system"? The fun starts with a 1280 x 480 high def LCD display. All the better for viewing graphical niceties like 3D city models and bird's eye view in the navigation system. There are 3D effects and menus throughout the interface, too, and it's all optimised for ease of use and minimal driver distraction. Apparently. A number of industry firsts are claimed to boot. For starters, without taking your hands off the wheel or eyes of the road you can dictate texts and emails. There's full-on iPhone integration and future revisions will support third party apps. Having played with this latest version of ConnectedDrive, it's certainly one of the slickest and best featured systems on the market, even if most of the raw functionality is mirrored by other big brands like Audi and Mercedes-Benz. But what of Harman's other projects? One of the more interesting is its app-centric platform. Based on Android, the idea is to give smartphone-orientated car owners an in-car experience to rival that of their favourite portable gadgets. The general gist is a combination of intuitive interface design, dedicated apps and better syncing with mobile devices. One clever idea involves on-screen icons that "grow" as the user's finger approaches, making it easier to make the right selection. Harman is also pitching its Premium Infotainment platform at CES. Highlights include the combination of touchless gesture controls and head up displays to deliver an augmented reality interface. In the short term, that could include painting navigation prompts like lane guidance onto the windscreen. Further out, a context-aware car connected to local infrastructure would know how much longer a traffic light was due to stay red and display emails while stationary. It's all pretty clever stuff but exactly when you can expect to see it in cars is a tricky subject. Car manufacturers tend to keep schtum until new models are launched for fear of customers holding out for the next best thing, so specifics are thin on the ground. But we reckon platforms like the app-centric Android system are - at most - 18 months away.